I resist the idea of buying a food because it’s politically correct. I have to admit I find Seeds of Change interesting, though – their mission is “to make organically grown seeds available to gardeners and farmers, while preserving countless heirloom seed varieties in danger of being lost to the ‘advances’ of modern industrial agriculture.” And they donate a percentage of their sales to support organic farming. But let’s face it: none of this matters unless the stuff tastes good. Because if it doesn’t taste good, they don’t have any sales to donate a percentage of, right? Looking at the flavors of their new line of chocolates, these people totally have my number: dark chocolate with mango and cashew, dark chocolate with cherries and vanilla, milk chocolate with “puffed grains,” dark chocolate with coconut. If they only had dark chocolate with ginger, I’d think they’d installed a chip in my brain and were reading my thoughts. I also love the packaging. Instead of one wrapped bar of chocolate, the flat cardboard package contains three separately wrapped one ounce bars. It’s all the pleasure of a Japanese candy but with better chocolate. It’s perhaps not the most environmentally friendly packaging, but it’s much friendlier to the waistline – it’s much easier not to eat more than one ounce this way. Where they let me down a bit is that the dark chocolate is only 61% cocoa. When I’m eating dark chocolate, I like DARK chocolate. These days, 61% dark is kid stuff. However, the only thing I don’t like about very dark chocolate is that the texture is often too hard. This doesn’t have that problem, at least – it’s a texture that breaks rather than snaps, if that makes sense, like milk chocolate. Mango is one of my favorite foods, but I don’t think I have ever had it combined with chocolate. But the mango and cashew is better than I expected. I’m not sure this combination would work with fresh fruit, but this is a fine fruit and nut bar sort of thing. Cherries, on the other hand, are one of the best things to combine with chocolate. The cherry bar reminds me a bit of getting to eat one of those old fashioned cherry cordials, but without all the gooky stuff on the inside and on your fingers. It’s a similar darkness and texture of chocolate but better in taste than what you get with your drugstore cherry cordials, along with the lack of mess. 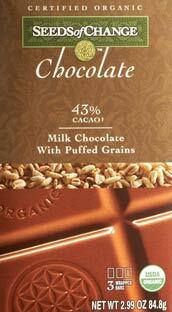 The milk chocolate with puffed grains was my favorite. Rather than puffed rice, the crunchy part is a “cereal crisp” made of flours from various grains – kind of like the crisp in a Crunky bar. It’s not as strongly flavored and lacks the malt flavor of a Crunky or most crispy rice bars but it’s a nice texture. Also in this one, I definitely have no argument with the chocolate itself. Rather than being a dark chocolate that’s not dark enough, it’s a milk chocolate that’s a little extra dark and not too sweet. I strongly approve of this one. Of these, the only one that I would buy again is the milk chocolate, because the dark chocolate isn’t dark enough for me. But if you’re not such a stickler for the darkness as I am, the dark varieties are definitely worth a try for the good flavor combinations. Don’t forget to check out the Change Tastes Good Contest over at the Seeds of Change website! You could win a whole bunch of chocolate!